In addition, Germany moved 300 metric tons of gold from New York to Frankfurt. Some of Germany’s gold remains in the U.S.
Now, more than half of the country’s $140 billion stockpile of gold is home in Frankfurt. That safe haven for wealth doesn’t just work for large countries. Gold is a critical component of your portfolio as well. But for all the hate that investors pile on gold, the precious metal continues to be a hedge against volatility in uncertain times. It is a place to store wealth. An insurance policy against disaster. 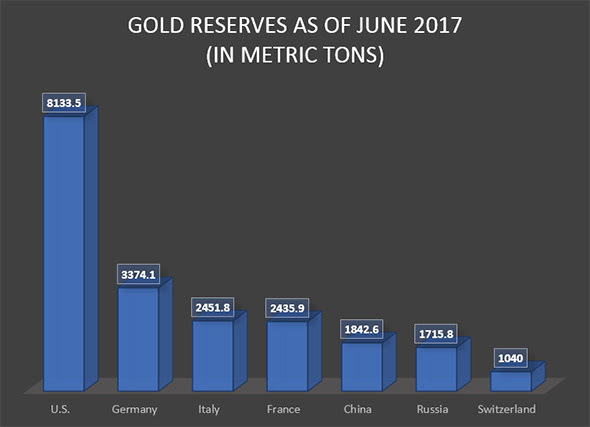 Just seven countries hold more than 20,993 metric tons of gold in reserve. That’s physical gold stored in vaults around the globe! But gold isn’t worthless. It isn’t an eyesore. Holding gold makes us feel safe. It means that we have a backup plan in place in case something goes truly wrong, because we have always valued gold. Another option is to invest in a gold exchange-traded fund (ETF) such as the SPDR Gold Trust (NYSE: GLD). The ETF simply follows the price of gold, but you don’t hold the physical gold. And a final option is to buy gold bullion.